The Little French Maison sits within the fortifications of the medieval village of Conques sur Orbiel. A typical French village house, tucked into a narrow street sitting in the shade from the Mediterranean sun, has beautiful views past the original 15th century tower towards the Black Mountains. Restored to celebrate the house's original features, The Little French Maison sleeps six in three double bedrooms, with two bathrooms, a generous kitchen and living room. It has a ground floor laundry room which is a perfect place to store bicycles safely. Let us take you on a tour of The Little French Maison, starting at the top of the house with magical views of La Montagne Noire. The white bedroom, made up with pure linen sheets, is cool and refreshing in the summer months. It has original shuttered windows as well as French windows with a stunning outlook over the pink terracotta tiled roofs of the village towards the highest point of La Montagne Noire, Pic de Nore. 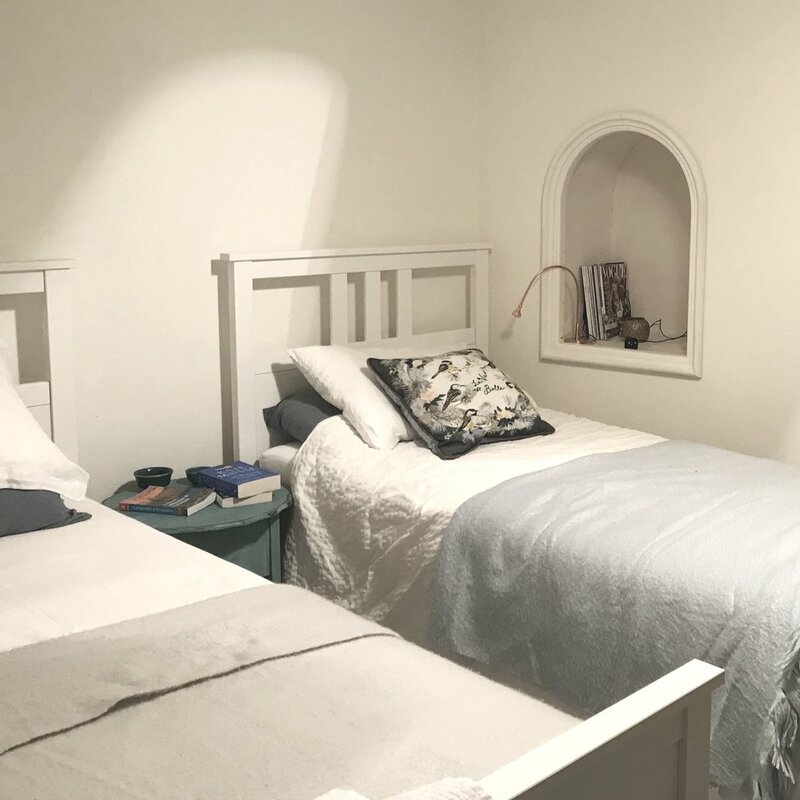 Sitting on the top floor of The Little French Maison, the French bedroom has a large comfortable antique bed, made up with pure linen sheets. This peaceful room has an original chestnut planked floor and shuttered windows. On the top floor of the house sits a pretty shower room and toilet. White, fluffy towels are provided. The living room is simply furnished with 2 squishy sofas, a record player and collection of vintage vinyl to play, to keep you entertained on balmy summer evenings. The original wooden floor has been carefully restored as a backdrop to the truly amazing views from our French windows, over the village to La Montagne Noire. A charming, fully equipped traditional kitchen with fridge, cooker, dishwasher and Nespresso machine. The original wooden floor, beamed ceiling and shuttered windows have been restored to breathe life into the house's historical features. It has a large, cool pantry. A log burner will keep you comfortable and cozy during winter stays. Perfectly practical, the laundry room maintains the style of a traditional French home with a deep, ceramic french sink combined with the modern amenities of a washing machine etc. This is an indoor space for cyclists needing somewhere to keep their bikes safe and secure. Situated on the ground floor this is a pretty bedroom featuring a beautiful stone wall, celebrating the heritage of the house. This room has two single beds with linen sheets. The ground floor bedroom is a wonderfully cool room in the heat of mid summer. This ground floor bathroom has both a bath and shower. This room retains the character and original use of the ground floor ‘cave'. White, fluffy towels are provided. The ancient front door leads off the narrow village street to the hallway with original stone walls and tiled floor. The house is approached by walking up the ramparts through what was the Porte de Montagne Noire. Free parking close to the house.